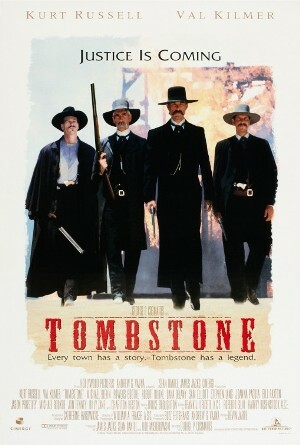 I can see “Tombstone” becoming a guilty pleasure for me – A film that romanticized the old west, far less concerned with historical accuracy and more concerned with showing how amazing these times were. On paper, “Tombstone” does very little differently from any other film adaptation of the incident that occurred at the O.K. Corral between Wyatt Earp, Doc Holliday and bunch of outlaws and cowboys, in particular John Ford’s “My Darling Clementine.” What the film changes are the characters and the amount of detail that goes into the violence and gun play. Doc Holliday receives a major face-lift, now being played by Val Kilmer, as a man who seems to have a death wish. He was diagnosed with tuberculosis and thought that the western air might improve his condition. All moving west did was proved to be a fortuitous occasion for Doc Holliday, as he spends his days playing poker (possibly cheating at it), and still claiming to be the fastest gun around, even in his condition. His vocabulary knows no bounds, as does his friendship with Wyatt Earp (Kurt Russell). Holliday is certainly the best character in “Tombstone,” being a man with nothing left to lose and just wants to spend his last days enjoying himself, like we all would. Other adaptations of this story have usually gone light on the violence, but “Tombstone” fully embraces the impact these guns would have back in the day, when even a shot to leg or arm was basically fatal. We see Wyatt Earp go charging into a room of unsuspecting cowboys, on horseback, and guns them all down without any remorse or second thought. The final confrontation between Earp and the lead cowboy is less of an epic strategy between both parties and more an outburst of raw anger. Overall, “Tombstone” was a blast to watch. Val Kilmer’s performance was both heart-breaking and hilarious, while the absurd amount of violence is startling to say the least. The film has changed historical events to suit its needs, but with story of the O.K. Corral being adapted so many times, it is nice to see something vastly different out there.